How important is it to instill leadership qualities into students? For many people, this type of experience can be the difference between job success and frustrated career stalling. Leadership skills help students take charge of their work while paving the path for others to succeed with them. But how are instructors supposed to tackle this topic amongst all their other course objectives? In this article, we will explore two ways to help students become better leaders. A quality shared by many great leaders is a love of learning. Leaders are constantly eager to expand their knowledge and skillset. 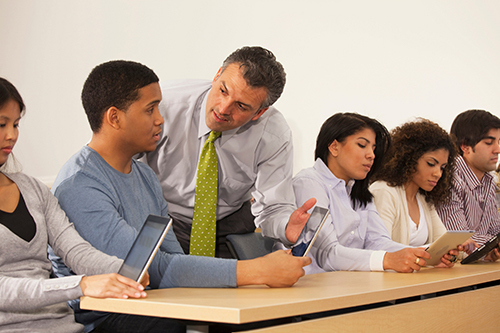 To encourage this quality in students, instructors can give stretch assignments such as improving public speaking skills, increasing computer literacy, or providing community service. Stretch assignments are a great way to combat complacency and stimulate growth, as they involve taking risks and diving into the unknown. By “changing things up,” students benefit from learning to reach beyond their comfort zone. A popular approach to leadership development is individualized coaching to address areas for improvement -- product knowledge, financial management, computer skills, interpersonal effectiveness, and so on. With personalized guidance, students can focus on the areas that they want to improve on most. Coaching typically involves an assessment of strengths and weaknesses and a series of one-on-one coaching sessions. These sessions focus on developmental needs and capitalize on practice and feedback to acquire needed skills. The person being coached or mentored must want to improve. Formal assessment of strengths and weaknesses is valuable. Some behaviors cannot be changed. Practice is critical for success. Accountability for effort must be maintained. Every student has the potential to be a great leader. With individualized coaching and encouragement for lifelong learning, instructors can equip the next generation with the necessary leadership skills to succeed in their professional lives and beyond. M. Goldsmith, What Got You Here Won't Get You There (New York: Hyperion, 2008); and N. Klippert et al., Maximizing Returns on Professional Executive Coaching (New York: Corporate Executive Board, 2003). D. Dunning, "The First Assistant, in Cynthia Jacobs, ed. Effective Leader, no. 2 (Seattle, WA: Corporate Leadership Consultants, 1996). T. Allen et al., "Career Benefits Associated with Mentoring for Protégés," Journal of Applied Psychology 89, no. 1 (2004), pp. 127-36; and M. Goldsmith et al., Coaching for Leadership (New York: Wiley Pfeiffer, 2012). S. Berglas, "The Very Real Dangers of Executive Coaching," Harvard Business Review (June 2002), pp. 86-93; and D. Peterson and M. Hicks, Leader as Coach (Minneapolis, MN: Personnel Decisions International, 1996), p. 14. T. Kreiner, "Social Entrepreneurship," Businessweek.com, March 9, 2012. George Manning is professor emeritus of psychology at Northern Kentucky University. He is a consultant to business, industry, and government, serving such clients as the AMA, AT&T, General Electric, IBM, Duke Energy, the United Auto Works, Young Presidents' Organization, the U/S. Navy, and the National Institutes of Health. He lectures on economic and social issues, including quality of work life, workforce values, and business ethics. He maintains as active program of research and writing in organizational psychology. His current studies and interests include the changing meaning of work, leadership ethics, and coping skills for personal and social change. Kent Curtis is professor emeritus of organizational leadership at North Kentucky University. He has examined the collegiate tutorial system as a visiting Fellow at the University of Durham in England and has designed numerous employee and management development programs serving such clients as Texas Medical Center, Junior Achievement, Wendy’s International, Procter & Gamble, and American Electric Power. He developed the Northern Kentucky University online organizational leadership degree. His current research includes leading teams, the leader as coach and developer of people, and teaching leadership via distance learning.